Wowsers! I’m familiar with and have used all of these verses before, but my friend Steve King assembles a doozy of an image. Selah! This entry was posted in Visual Scripture and tagged 2 Timothy, heresy, law, Torah, traditions of men, Truth. Bookmark the permalink. Talk about a flaming arrow . . . So, let me see if I have this correct. Follow along with me and help me out if I am missing something. If we do not make up our definitions, and we let the Scriptures define things for us, then we can conclude from the passage in Psalms that the Law is the truth. Right? 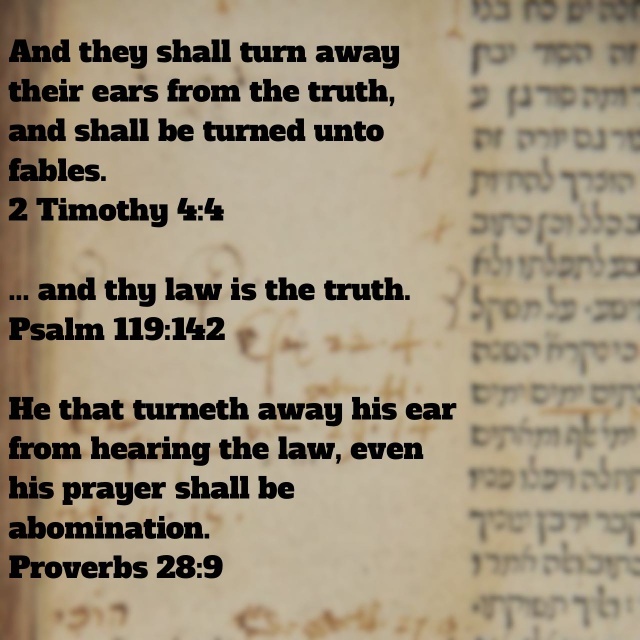 Timothy then tells us that if we turn away the truth … meaning the law … then we are left with fables … meaning a fictitious story, something made up, a myth, a tale … basically something that is not true. Proverbs tells us that if we do not “hear” the Torah, then our prayer is an abomination. Note that the word “hear” is the Hebrew word “Shema” … and it means a whole lot more than just hearing something. A short description would be “hearing and heeding what you heard”. OK … have I got it right? If that is the case, then I think we should all follow in the Messiah’s footsteps and “hear the Law”. That was easy to figure out, wasn’t it? Deu 30:3 then YHWH your God will turn your captivity. And He will have compassion on you, and will return and gather you from all the nations where YHWH your God has scattered you. Deu 30:4 If you are driven out into the outermost parts of the heavens, YHWH your God will gather you from there, and He will bring you from there. Deu 30:5 And YHWH your God will bring you into the land which your fathers possessed, and you shall possess it. And He will do you good, and multiply you above your fathers. Deu 30:6 And YHWH your God will circumcise your heart and the heart of your seed, to love YHWH your God with all your heart and with all your soul, so that you may live. Deu 30:7 And YHWH your God will put all these curses on your enemies, and on those that hate you, who persecuted you. Deu 30:8 And you shall return and obey the voice of YHWH, and do all His commandments which I command you today. Deu 30:10 for you shall listen to the voice of YHWH your God, to keep His commandments and His statutes which are written in this book of the Law, and if you turn to YHWH your God with all your heart and with all your soul. Deu 30:11 For this commandment which I command you today is not hidden from you, neither is it far off. Deu 30:12 It is not in Heaven, that you should say, Who shall go up for us to Heaven, and bring it to us, so that we may hear it and do it? Deu 30:13 Nor is it beyond the sea, that you should say, Who shall go over the sea for us to the region beyond the sea, and bring it to us, so that we may hear it and do it? Deu 30:14 But the Word is very near you, in your mouth and in your heart, so that you may do it. Looks good to me…. Kinda what I see, too! Nicely, all the pieces fit. No dangling ends like ‘ceremonial law’ or ‘Jewish’ Feasts, etc….